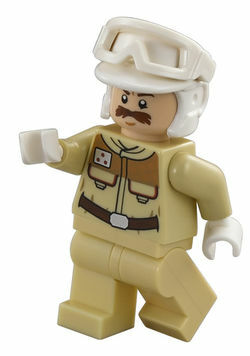 Bren Derlin, also referred to as a Rebel Trooper or Hoth Officer, is a minifigure from the LEGO Classic Star Wars line. The only difference between this officer and the older Hoth Rebel Trooper is the helmet. With the introduction of the new trooper, there is a difference between those. The officer uses the Enemy Boxer's and the Nazi Officers' head from the Indiana Jones theme. This head is also a redone version of J. Jonah Jameson's head from Spider-Man (Theme). The minifigure was only ever officially referred to as a "Rebel Trooper" or "Hoth Officer" until an official display of over 500 minifigures was shown at the 2014 Comic-Con International: San Diego. In the LEGO Star Wars: The Freemaker Adventures episode "The Storms of Taul", Bren Derlin is voiced by John Ratzenberger, who originally played Derlin in Star Wars: Episode V The Empire Strikes Back. This page was last edited on 18 October 2017, at 11:50.